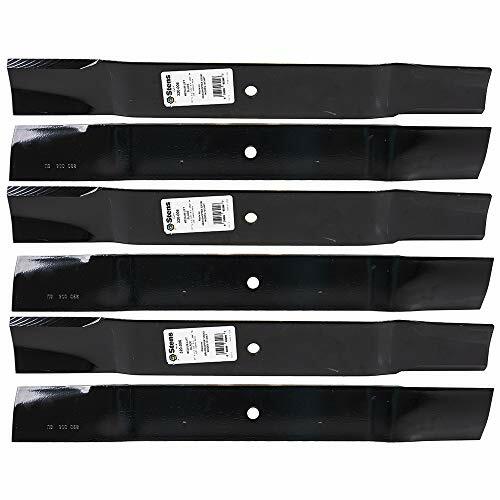 Six (6) Pack Rotary Mower Blades Replace Grasshopper 320245 And 320243 Requires (3) Blades For 61"
Replaces OEM# Grasshopper: 320243, 320245, 320245B Woods: 70134, 70134KT Fits Models: COUNTRY CLIPPER: 3 for 60" DIXON: 3 for 60" GRASSHOPPER: Duramax 3461, Duramax 9861, 3 for 61" SNAPPER/KEES: ZTR, 3 for 60" WOODS/HESSTON: 3 for 61" Specifications: LENGTH 21" WIDTH 2-1/2" C. H. DIA 1/2" THICKNESS 0.2040"
Pack of 3 - Stens 320-040 Notched Air-Lift Blade. Replaces OEM: Grasshopper 320239 ; Woods 70104 / 70117. Fits Grasshopper 3452, 6052, 6152, 9052, 9252, 9352, 9552, 9652 and 9852. NOTE: REQUIRES 3 BLADES FOR 52" DECKS. 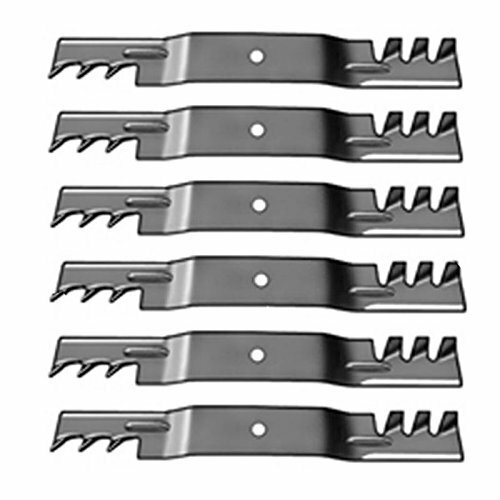 61" Deck G6 Gator Mulching Blades by Oregon Fits Snapper, Grasshopper, Woods Blades are 21"
Six (6) Pack Rotary Copperhead Mower Blades To Replace Grasshopper And Woods 320243 Requires (3) Blades For 61"
Rotary (9) 13464 Mower Blades Grasshopper 320245, 320243, 320245B, 61"
Set Of 6 Lawn Mower Blades Replaces OEM Grasshopper 320236 Grasshopper 320237 Grasshopper 320239 Copperhead Mulching Blade fits Grasshopper. Requires (3) blades to fit a 52" cut. Also fits Woods. C. H. DIA: 1/2" LENGTH: 18" THICKNESS: 0.2040" WIDTH: 2-1/2"
6 Lawn Mower Hi-Lift Blades Grasshopper 61" Duramax Deck 9861 3461 Mowers 320245Notched Hi-Lift Blade Grasshopper 320245Fits: Grasshopper Duramax decks, 9861 and 3461; Requires 3 for 61" deckReplaces OEM Part Numbers: Grasshopper: 320243, 320245, 320245BHi-Lift Blade Specs: Length: 21", Center Hole: 1/2", Width: 2 1/2", Thickness: .250"
6 Heavy Duty Lawn Mower 52" Deck Blades Grasshopper Woods 320239 70104 70117Air-Lift Blade Grasshopper 320239Fits: Grasshopper: 3452, 6052, 6152, 9052, 9252, 9352, 9552, 9652 and 9852; requires 3 for 52" deck; Woods: Requires 3 for 52" deckBlade Replaces OEM Part Numbers: Grasshopper: 320239; Woods: 70104, 70117Blade Specs: Length: 18", Center Hole: 1/2", Width: 2 1/2", Thickness: .250"Width:�2 1/2 "
9 Lawn Mower Hi-Lift Blades Grasshopper 61" Duramax Deck 9861 3461 Mowers 320245Notched Hi-Lift Blade Grasshopper 320245Fits: Grasshopper Duramax decks, 9861 and 3461; Requires 3 for 61" deckReplaces OEM Part Numbers: Grasshopper: 320243, 320245, 320245BHi-Lift Blade Specs: Length: 21", Center Hole: 1/2", Width: 2 1/2", Thickness: .250"
Genuine Oregon 396-612 Grasshopper Gator Mulcher 3-in-1 Replacement Lawn Mower Blade 21". Length: 20-9/16-inches. 3-in-1 blade. 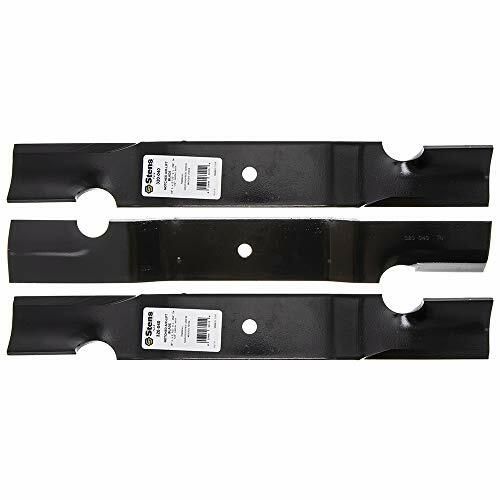 Rotary® 13464 6 Mower Blades for Grasshopper® 320243 320245(B) 21” Length 2-1/2” Width .240” Thickness 1/2” Center Hole Fits 61in. 2 Lawn Mower Blades for Craftsman LT1000 Brand New - Unused PartsFits Many Husqvarna, Poulan, Craftsman Mowers with 42" Decks Including the Craftsman LT1000 Series Replaces Part Numbers: 138971, 134149, 127843, 138498, 422719, 532138971, 532134149, 532127843, 532138498, 532422719 Measures 21 1/16 " Length x 2 1/4" Width x .134" Thick5 Point Star Center Hole Made in the USA! 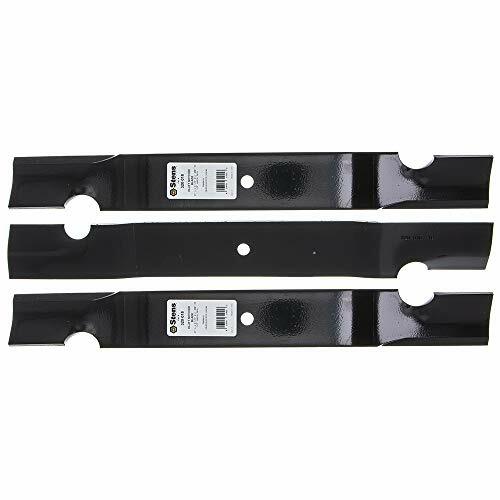 Includes 2 Replacement Mower Blades Top Quality, Generic Aftermarket Part 30 Day Money Back Guarantee This part is a top quality, generic aftermarket replacement part. Fit and function are guaranteed for 30 days or your money back. Any reference to brand or model numbers is intended for identification purposes only. This product does not include any warranty from the manufacturer. Many replacement parts should only be installed by a professional. Be safe. If you are not qualified to install this item, you may return it. 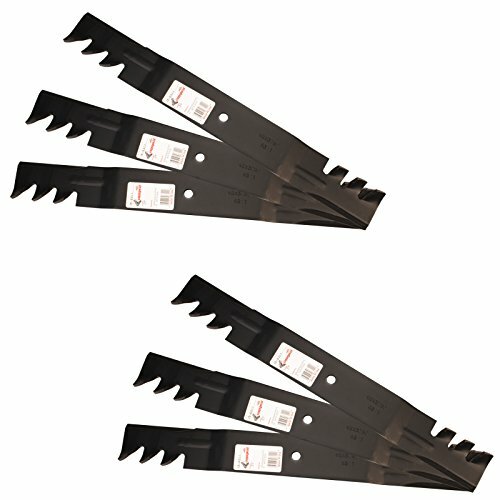 Keep a beautifully groomed lawn this season with some help from the Universal Deck Mower Blade. 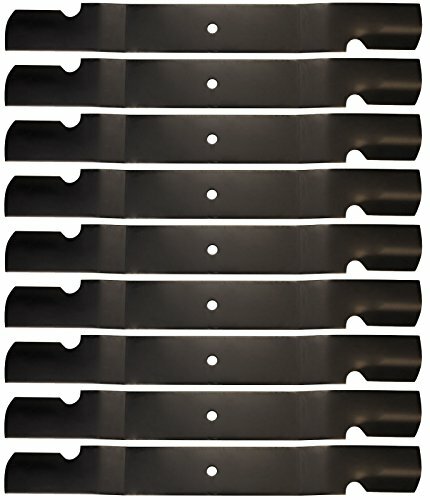 Rotary® 6311 9 Mower Blades for Country Clipper® Grasshopper® Woods® 21” Length 2-1/2” Width .204” Thickness 1/2” Center Hole Fits 61in. 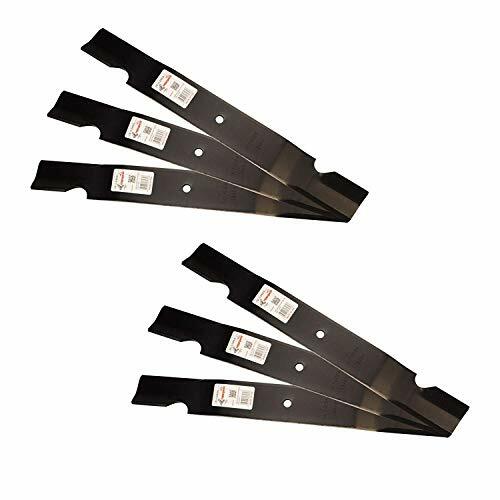 9 Lawn Mower Deck Blades Woods Grasshopper Snapper 61" Cut Deck 320242Medium-Lift Blade Grasshopper 320242Fits Grasshopper requires 3 for 61" deck - Snapper requires 3 for 61" deck - Woods requires 3 for 61" deckBlade Replaces OEM Part Numbers: Grasshopper: 320242, 320243; Lesco: 050124; Snapper: 7-9222, 7079222, 7079371, 7079371BM, 7079371BMYP, 7079371YP, 79371; Woods: 70134, 70134KT, 70142Blade Specs: Length: 21" Center Hole: 1/2" Width: 2 1/2" Thickness: .250"
The Murray 24" Riding Mower Blade is the original replacement blade for 942-0760. It is sturdy, sharp and long lasting. 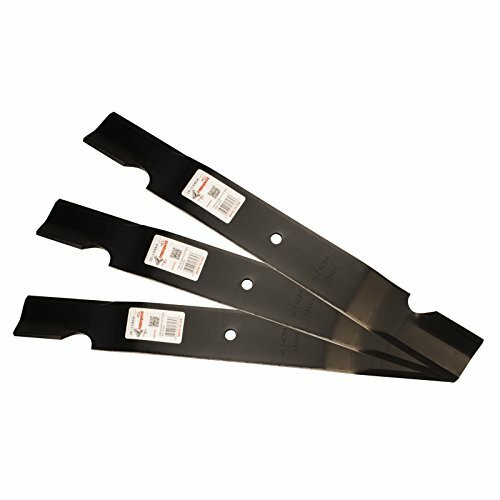 With the power of three important functions combined into the ease of one blade, you can use this lawn mower blade for cutting, bagging and mulching. This item helps you keep your yard in top shape. 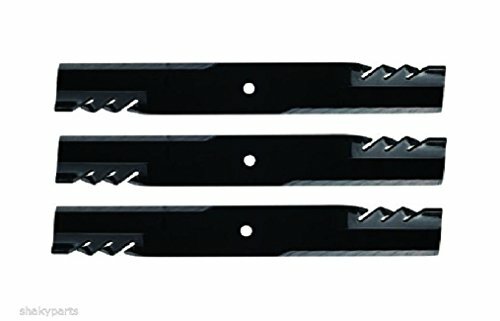 4 Lawn Mower Blades 42" Deck Husqvarna AYP Sears Craftsman Mowers 532134149Mulching Blade AYP 532134149Fits Models: Poulan: Requires 2 for 42" deck, RZ4620, RZ5422, RZ5424, 342074B, PB175A46, PB175A46, PB195A46LT, PB195A46LT, PB195H42LT, PB20A42LT, PB20A46LT, PB22H42YT, PO14542LT, PO17542LT, PO19542LT, PP12542J, PP125H42J, PP125H42JA, PP14542K, PP14542KB, PP15H42K, PP15H42KB, PP185A42, PR1742STF, WET1742STA, WET2242STB, WET2242STC, WET2242STDFits Models: Husqvarna: LT125, LT130, LT16542, LT18542, LTH125, LTH130, LTH140, LTH145, LTH1542, LTH1742A, LTH1742B, LTH1742C, LTH1742D, LTH18542A, LTH18542B, LTH18542C, LTH2042, LTH2042B, LTH2042C, RZ4216CA, RZ4219BF, RZ4221BF, RZ4221, YT150, YT180, YT190, YT1942, YT16542, YTH1342XPA, YTH145, YTH150, YTH1452XPA, YTH1542A, YTH1542B, YTH1542C, YTH1542XP, YTH1542XPB, YTH1542XPC, YTH1542XPD, YTH1542XPE, YTH1542XPF, YTH1542XPG, Z4218KOA, Z4219, Z4220Replaces OEM Part Numbers: Craftsman: 134149, Husqvarna: 532134149, 777134149, Poulan: 531307223, 532134149Replaces OEM Part Numbers: AYP: 134149, 24676, 422719, 424752, 531005085, 531307223, 532134149, 532422719, 532424752, 539110460, 91724676, 917532422719, 917532424752, 917539110460, 917777134149, 954636867Blade Specs: Length: 21", Center Hole: 5 pt. 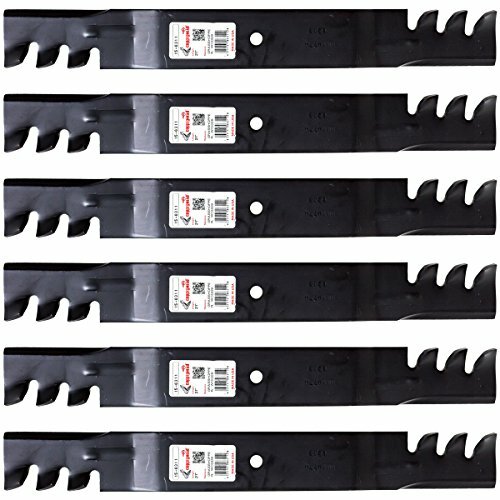 star, Width: 2 1/4", Thickness: .134"
Oregon Mower Blade for 61"
Made of quality materials that are built to last and get the job done, this product will make your outdoor work substantially easier. Get out and get the job done, but get it done the right way with this product.